Curry powder is a blend of several spices that are used to mimic the flavors of Indian cuisine. The most common spices included in curry powder are turmeric, coriander, cumin and fenugreek. Ginger, garlic and black pepper are also included in some curry powder blends. These spices can have powerful benefits for your health. The combination of spices in curry powder supply you with some potent antioxidants that may improve the health of your gut. Deirdre Rawlings and Jacob Teitelbaum report in their book, "Food that Helps Win the Battle Against Fibromyalgia," that adding curry powder to your diet will promote efficient digestion of your food, as well as increase the amount of good bacteria in your bowels and intestines. Keeping your good bacteria levels high will help you digest food, eliminate waste normally and prevent germs and bacteria from causing diarrhea and gas. As you get older, your brain may not work as quickly and efficiently as it should. Adding curry powder to your diet may improve brain function and protect you from age related brain decline. Janet Horn and Robin H. Miller report in their book, "The Smart Woman's Guide to Midlife and Beyond," that the spices in curry powder, particularly turmeric, may protect your brain by preventing cognitive disorders like Alzheimer's disease as it may help prevent inflammation and plaque formation. The compounds in curry powder spices may help in the fight against cancer. Horn and Miller note that the most common spices in curry powder may help reduce inflammation in your body. 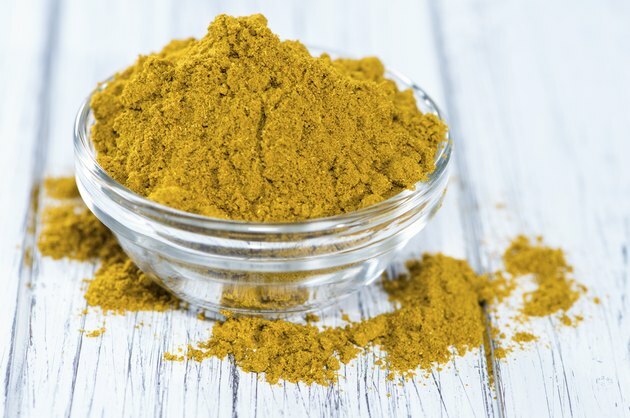 Chronic inflammation can lead to the development of cancerous cells, so adding curry powder may help treat your inflammation as well as aid in preventing the formation of cancer cells. Carolyn F. Katzin, author of "The Everything Cancer-Fighting Cookbook," recommends toasting curry powder before using it as that will release more of the oils may help prevent cancer. Having high LDL levels of cholesterol can lead to serious illness including heart disease and high blood pressure. Sandra Cabot and Margaret Jasinka note in their book, "Cholesterol: The Real Truth" that the turmeric in curry powder is the reason that this spice can help lower your cholesterol levels. Turmeric can also aid in the prevention of heart disease by helping to prevent plaque formation in your arteries.